Famitsu Interviews Nomura and Shimomura: Production on KINGDOM HEARTS 3's Music to Start Soon! KINGDOM HEARTS Orchestra -World Tour- wrapped up its final performances in Osaka, Japan a few days ago. After the concerts, Famitsu had the opportunity to sit down with Series Director Tetsuya Nomura and Composer Yoko Shimomura to ask them about their experiences with the performances, the announcements to be made at D23 Expo, and KINGDOM HEARTS III. I heard you (Shimomura) and Mr. Nomura had a little discussion before concerts today, what was that all about? That’s definitely music we’d love to hear! So Ms. Shimomura, how’s that production coming along? Week after week, I’ve been travelling all around, from Hong Kong to Los Angeles… But It’s all finally come to a close now so soon I can get to work… I may have gotten a bit stale by now, though. We’re really looking forward to hearing your songs run in future new trailers (laughs). So, Mr. Nomura, in the daytime concert, you announced something about some new information that was coming next week that created somewhat of a hurdle for yourself? Shimomura: But the new world is amazing! I was like “Wooaahh!”. I got really excited. This is a small snippit from the interview, translated by Saken! Full translations will be available as soon as possible. Re: Famitsu Interviews Nomura and Shimomura: Production on KINGDOM HEARTS 3's Music to Start Soon! Can I just say how I dig the constant teasing between Nomura and Shimomura? He just can't resist ruffling her feathers, can he? Lol. These Sora- Riku- and NaminÃ©-"plushies" also look totally cute and hilarious at the same time. It certainly was refreshing to have such a playful interview (poor Sign was confused and couldn't tell if anything they were saying was truthful or playful). It's nice that it seems Shimomura has begun writing a few songs and now has time to fully get into it. I'd be worried about the fact that KH3's music production hasn't started yet, but then I wondered. When did Yoko start composing KH2's music? No, really, when? I wouldn't be too worried. She has plenty of time to write the music and record, especially if March 2018 is the earliest they might aim for. They re-recorded all of Kingdom Hearts II's music within like 2 days, so it shouldn't be too long between her finishing writing the music and the final recording being added to the game. They rerecorded KH2's music within TWO DAYS?! I should specify that it was rerecorded for 2.5, just in case anyone gets confused. - How long did it take to record the music for HD 2.5 ReMIX? We learned that the team working on the HD 1.5 ReMIX soundtrack only had about two days to work on it! Hopefully you were allowed more time than that? SN: The entire recording process took about 15 hours in a span of 2.5 days, coincidentally. Thanks to our amazing musicians, we were able to comfortably finish recording 54 songs in such a short period. Just in case, when does production for music in games usually start in the development cycle? Nomura and Shimomura feel like the mother and father of the KH series. I remember the last interview they had together was just as much fun. what the incredble new information then if we going to ordinary news then? They're based off a Disney Consumer Brand called Duffy the Disney Bear. For some unbeknownst reason, they've exploded in popularity in Japan. Regardless, this isn't the first time that Kingdom Hearts has dabble with other Disney toys, as there's been cross-promotion with Tsum Tsum. The Fami reporter and Shimomura got excited at the world. I really hope it's something spectacular! I remember Frozen being hugely popular in Japan, even more than in, say, the US. So maybe it's that? Frozen is the only thing that comes to mind that was super popular in japan that would make them excited like this. After that i'm not sure what else is popular in Japan.Is Toy story and Wreck it Ralph popular there? I can't quite equate "popular in Japan" with "it sounds amazing, I got excited". The responses, despite Famitsu being way over the top, are very general and broad with what it could be because ultimately Square doesn't want any hints out there aha. Take Toy Story for example. Being told that would be a world does sound amazing right? I'm not sure how popular Toy Story was in Japan, if you were told in confidence that the first Pixar world was coming to KH, it'd get you excited. Or perhaps you're told about Treasure Planet, because this is the only other world my tired brain can think of atm, and that they've been working on developing Sky Pirates and space ports and whatnot. It sounds amazing and would get you excited. I have no idea where this notion came from that it had to be "popular" in Japan for it to be considered the upcoming world. I was thinking Frozen too, but if that keyblade transformation is anything to go by then there is no way it's Frozen imo. Unless it doesn't have anything to do with the new world. You need to finish all of them, like around 700? Especially when Shimomura and the Famitsu reporter's excitement could just as easily be because the world was totally unexpected. I'm really excited for KH3 music. One of the things I'm most looking forward to, especially after the amazing new track we got in 0.2. Shimomura is so incredible and just keeps getting better, KH3 is going to sound perfect. It's gonna be so good. For most projects, music composition usually comes way later on in development so composers have references to scenes, story, and character descriptions. With games, they tend to get some songs done early on for promotional purposes and finish the rest mid-to-late development. That's a great sign! Can't wait to hear what she comes up with! Her work is always the best. i think she already received reference materials. it was mentioned in the polygon interview last month. damn, i'm really happy about the development situation. Hm. Yes, that makes sense. Oh, can't forget the boss themes. Also, 700. Can't tell if Nomura is joking or if that's the actual amount of songs. I always love hearing new music from Yoko Shimomura. It gets me excited every time. I hope she's doing well with the progress! Yeah, you're right. No one would be able to compose and record 700 songs in a reasonable amount of time. Oh i know they don't choose worlds based on popularity in japan.It's just their excitement that's messing with me. @DefiantTheArt I actually think that the girl bear might be Kairi, as she's the only one to have ever worn that dress with a bow in her hair (in that one Kingdom Hearts Chi key art). Or maybe they just made her and put the bow on her, so one could choose to see her as whichever girl they wished. I'm so happy that things are finally moving forward. I get really excited and relaxed at the same time when I hear Kingdom Hearts music. Unrealated, but I'm hopefully attending the Distant Worlds Final Fantasy concert in Chicago. It's just a shame that I missed the Kingdom Hearts concert. I think they just put a bow on her because the plushie is ShellieMay, and she is always seen wearing a bow. 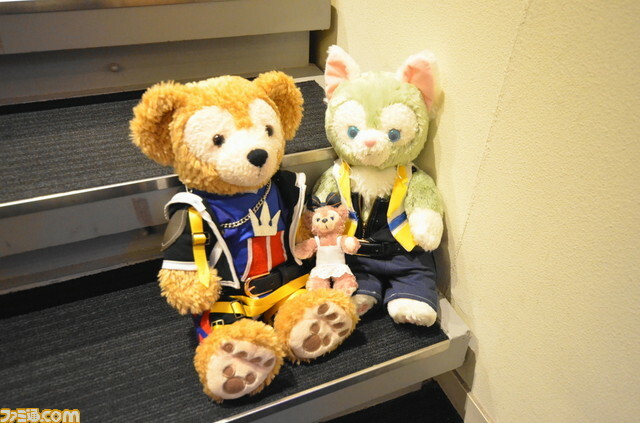 The Sora bear is Duffy, and the Riku cat is Gelatoni. Hm, about the music again, does this mean they locked in boss fights as well? All worlds, story, scenario, and bosses would have been locked in for a while now. yea Nomura said all of the worlds had been finalized at the time big hero 6 was announced. It was one of the last worlds chosen for the game. I don't recall ever reading that. Could you post a link the interview/quote? Nomura: In the KINGDOM HEARTS series, I donâ€™t think there has been an actual happy ending. KINGDOM HEARTS II is close to it. Since most of the titles have ended in cliffhangers, weâ€™re worried about what we should include in KINGDOM HEARTS III. #3 Where KH3 is in development: Don't feel comfortable giving a specific percentage, but key gameplay mechanics, concepts and worlds have been finalized, and staff have proceeded into full production. There was also a quote from him about how they got Disney movies in advance to pick worlds from and big hero 6 was one of the last movies they got before they had to finalize. I can't remember where that quote was though. But yea, don't be expecting like moana or even inside out. That's point one in the Playstation Access video, that they view works early. I don't recall anything about Big Hero 7 being one of the last movies they finalised. I do recall that Nomura had to make a trip around June-August 2015 to talk with Disney about some stuff, maybe that's what you're thinking of? So, given these quotes and that the music is being worked on now, is it okay for me to say that we're nearing the end of development? Or are there still things I don't know about? I'd hope it's in Alpha as feature complete and now they are just working on improving the quality, squashing bugs, making sure everything works. A game in alpha is feature complete, that is, game is playable and contains all the major features. These features may be further revised based on testing and feedback. Additional small, new features may be added, similarly planned, but unimplemented features may be dropped. Programmers focus mainly on finishing the codebase, rather than implementing additions. Alpha occurs eight to ten months before code release, but this can vary significantly based on the scope of content and assets any given game has. Final Fantasy XV was feature complete in like October 2015 I believe? Just under a year from it's full release. If it's not in alpha by the fall, then we've definitely got some problems with this game lol. Yeah. Considering That the Japanese and English versions of the Orchestra Trailer have slight differences I'd assume it's in a playable state. From my knowledge, I think sound work like voicing and music comes late into production. I think we're fine. Nomura...such a twisted man. This man thought it was funny to initially "overhype" the D23 trailer. The darkness seems have a hold on him. In all honestly, it is kinda funny. I'm just hyped we're getting a new KH3 trailer in a couple days. What I meant was I was hoping everything big was done and set in stone so it's completing alpha and moving into beta when music and additional stuff would be added. I think. IDK I don't make video games. I honestly can't see it happening, just because Big Hero 6 is very similar. Hoping for Star Wars but EA has Star Wars game rights. Ruining Battlefront wasn't enough for them. I don't think that's necessarily true. TT Games / Warner Bros released a Star Wars game in Dec 2015. I doubt it's in alpha yet. Wasn't Nomura saying when 2.8 came out they hadn't even started on some of the worlds? Wow, I feel like the game is almost definitely going to be coming in 2018. Yoko must know all the worlds if she is going to compose for them. Im sure worlds have gotten cut, but Nomura was saying there were worlds they needed to do they hadn't gotten to yet. There's no way this game has been in alpha, at best it's just gotten there but I realistically I think it's more likely to have it in alpha by the end of the calendar year based on his previous quotes this year.